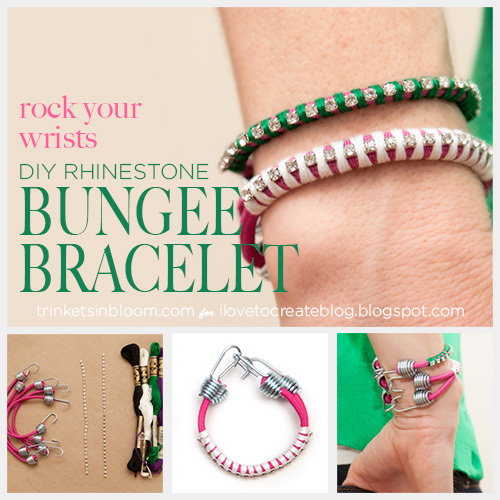 Create fun and sparkly bracelets using bungee cords as the base with this Rhinestone Bungee Bracelet DIY tutorial. 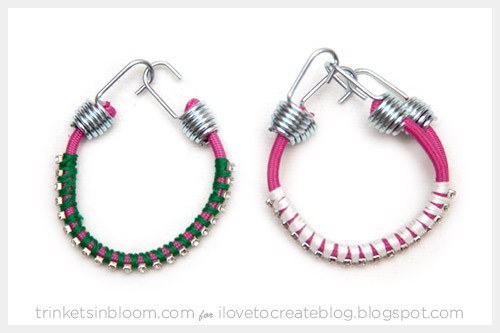 These bungee cords from Tulip have smooth ends that won’t scrape you and are surprisingly perfect for bracelets. 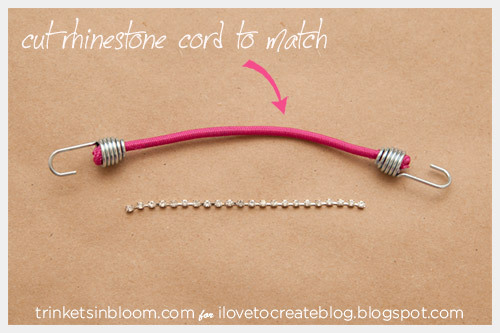 Measure out your rhinestone cord to be a little shorter than your bungee cord. Glue the end of your embroidery floss to your bungee cord with your fabric glue. Give yourself some space from the end of the bungee. 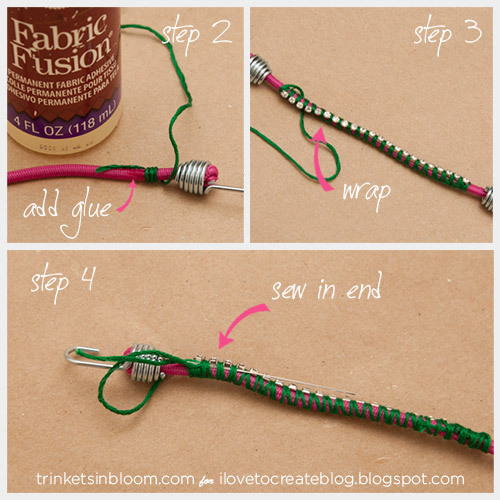 Wrap your embroidery floss around your bungee cord a few times. Lay your rhinestone cord on top of your bungee cord and wrap your embroidery floss around your bungee cord and your rhinestone cord together. For this single bungee cord bracelet I wrapped my embroidery floss twice in between rhinestones. Do this all the way to the end of your bungee cord. When you are finished wrapping, cut your embroidery floss leaving a few inches to work with. Using your needle, run the end of your embroidery floss through your wrapping to secure. You can add a drop of fabric glue to this end to help hold it. 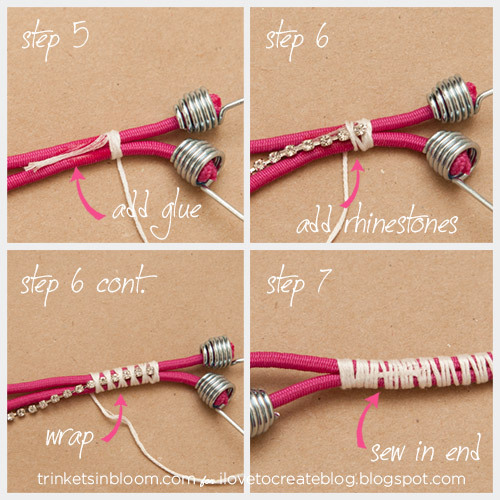 To make a bracelet using 2 bungee cords, work exactly as you did for the single one, starting with glueing the end and wrapping the 2 bungee cords together. 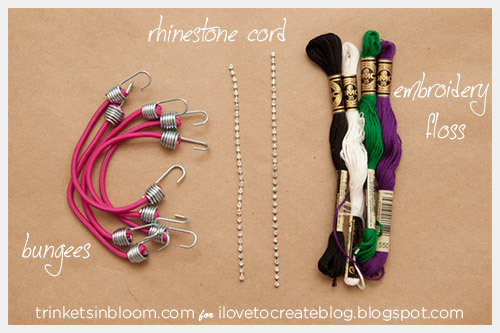 Add your rhinestone cord and wrap your embroidery floss around both bungee cords and your rhinestone cord, wrapping 3 times in between rhinestones. When you’re finished wrapping, run your thread through your wrapping to secure. One of the things I liked best about using bungee cords for these bracelets is how easy they are to put on and take off. 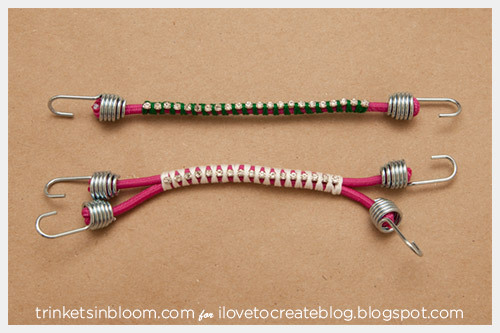 With the bracelets coming in a pack of 5, you can easily make a few bracelets to stack or give as gifts! With the holidays right around the corner these bracelets would make the perfect stocking stuffer or gift for a friend. 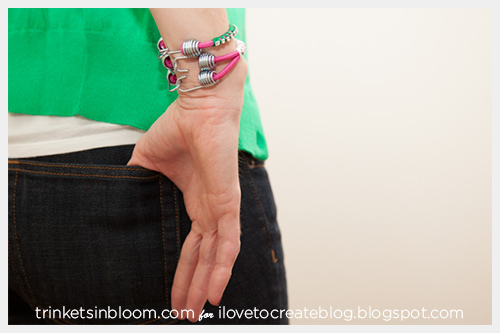 To see more fun fashion DIY's check out my blog Trinkets in Bloom! Rest assured that I will be going to give this DIY idea a try. This is so cute and seems easy to make. And I guess this would be a perfect gift this Christmas. Oh, how sparkly! Love the tutorial and the ideas, thanks! If someone want to read more about that Bungee Jump I think this is the right place for you!